OUR STORY: Sports Attack began engineering and manufacturing its patented ball-throwing machines for multiple sports in 1995. Today, these machines are used by leading professional teams and top universities that read like a “Who’s Who” of sports. The Ace Attack tennis model has been time-tested in the field for nearly 2 decades. Is practicing the Return of Serve really that important to practice? There are dozens of reasons for a competitive tennis player to regularly practice their Return of Serve. Next to the serve, it’s the most common hit shot in tennis. And, arguably it is the most important shot because when players have exceptional service returns they ALWAYS compete better. Example: The top 4 ranked players in the world generally have the top 4 Return of Serve statistics, but they do NOT have the best serving statistics in the game. If you had to increase practicing one shot in tennis, make it the Return of Serve. Is there any tennis ball machine that competes with the Ace Attack? The Ace Attack is unique in two critical ways: Function and price. While it doesn’t have the complex computer programmable functions of its main competition, it functions similarly with some unique advantages and at about half the price. Yes, see our “Creative Ways to Use a Ball Machine” document for numerous fun ideas to get the most out of your new machine. Sports Attack ball machines were first in production in 1995. Some of those first machines are still in service. The tennis machines have been in service since 2000, with one upgrade release made in late 2015. Existing owners can inexpensively get this upgrade kit. Please inquire. Yes, detailed instructions come with each machine. Please read them before operating the machine. What shots can the Ace Attack throw and are there any limitations? How is arc on the machine adjusted? The feed angle on the Ace Attack is easily adjusted to change the arc of the ball. Locate the lever arm that is attached in the back of the ball feed panel. In the low position turn knob itself with your hand. In the raised serving position, use the lever pole to change the angle. Turn counter-clockwise to increase the arc and clockwise to feed lower. How fast can the feed frequency be adjusted? The Ace Attack will feed balls at one second intervals when it is feeding in the “one-line” position. If the machine is oscillating side to side, the fastest feed rate is in two second intervals. What kind of balls can be used? Regular pressurized and non-pressurized balls both work just fine. Also, it should be noted that all slower transition balls (red, orange, green) also work fine, including the most oversized red felt balls. I own a “first generation” Ace Attack before the remote was included with each machine. Can I get install a remote afterwards? Holes for the remote receiver have been predrilled on all machines since 2000. Adding a remote later only requires connecting three wires. Detailed instructions are provided. Contact Oncourt Offcourt. After placing my order, how soon can I expect to receive my Ace Attack? Machines generally ship in 2-3 days; not longer than one week. You will receive tracking information. 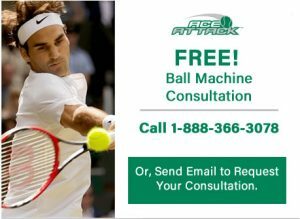 For retail customers, Oncourt Offcourt ships all tennis and pickleball ball machines over $350 free of charge to the lower 48 United States. If shipping outside the 48 contiguous United States, Oncourt Offcourt gives a $100 credit towards shipping costs on machines over that price point. What shipping method is used to ship the Ace Attack? Machines ship by insured freight. Does the Ace Attack require assembly or additional equipment? Light assembly of the non-marking casters and ball bin are required. A properly rated and approved power cord and tennis balls are the only extra “extras” that a customer will need. What safety precautions should I take before/while using the Ace Attack? Never walk in front of the machine or insert your hand into the machine when it is operating. Start the Ace Attack at a relatively slow ball speed and adjust from there. Also, since you are using many balls, be careful to clear balls that may get underfoot and present a hazard. Hitting that extra shot is not worth a sprained ankle! Where is the Ace Attack manufactured? What company makes the Ace Attack? Sports Attack is a leading sports ball machine manufacturer. Oncourt Offcourt exclusively handles its worldwide tennis distribution. Turn the machine off and cover it, just like you would with any electrical appliance. What maintenance should be done on the Ace Attack? Refer to the manual for general care. There is no regular maintenance required. The only thing to be aware of to maintain optimum ball speed is to replace the throwing wheels when ball speed decreases below the desired level. This is needed on ALL ball machines, although most users don’t bother. How often? This depends on frequency of use. It could be in 5 years, 10 years, or more. What is the warranty on the Ace Attack? Refer to warranty statement in the Ace Attack Fact Sheet.